The first public available Beta version of Windows 7 (Windows Seven) has the "Send Feedback" option in order to collect and gather beta testers reviews and opinions to build more enhanced versions of current Windows 7 Build 7000. The tool to collect Windows 7 users reviews is the Send Feedback tool which can be easily reached by clicking on a link button that is nearly placed on every application window on the right top corner. Also after the installation of Windows Seven is completed and your profile is being generated, a short-cut which opens again the same Send Feedback review screen is placed on your desktop just beside the Recycle Bin shortcut icon. Since the public available released build "Windows 7 Build 7000" is build and relased for testing purposes only, it is acceptable to place the Send Feedback buttons on every window and place a short-cut on desktop. All these actions aim to be closer to a wide range of user experience. The watermark which is also a reminder for the users that the Windows Seven Build 7000 is a time-limited beta version of next Microsoft client operation system is shown on the below screenshot. Since the sending feedback option is developed for a time limited period and will be removed propably with the RTM release of Windows 7, the Send Feedback utility is controlled by a switch on the client system side. And the switch which controls the visibility of the Send Feedback buttons on every application window is kept in the registry of the system just like many other controls and parameters are kept in Windows Registry. If you do not think to send feedback to Microsoft about your experiences on Windows Seven, you may find the links or buttons disturbing and want to remove them. To edit the registry in order to remove the send feedback buttons and disable send feedback option, you can either open the Windows Registry and edit it by using a registry editor tool like Registry Editor (RegEdit) or you can download and merge the following .reg registry file by a double click on the file. 3) If User Account Control dialog screen is displayed the following warning message will be displayed to you, you should confirm permission by clicking YES button to proceed for the following actions. 5) In the right pane of the Registry Editor screen, you will see a key named FeedbackToolEnabled. Double click the key FeedbackToolEnabled to set its DWORD (32-bit) value to "0". 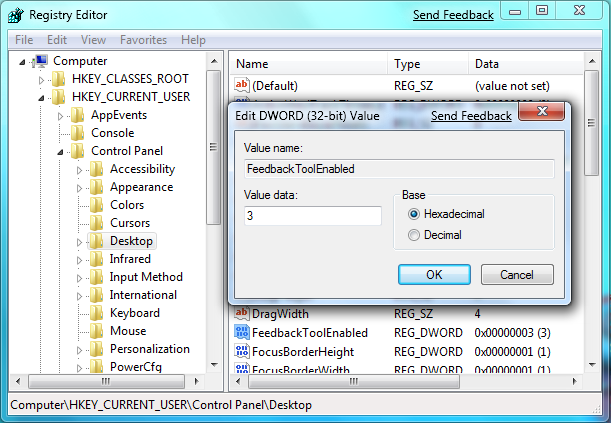 6) If the FeedbackToolEnabled key does not exist, add a new DWORD value key with name FeedbackToolEnabled. And set its value to 0. 7) Reboot. After you restart your computer, the registry change on FeedbackToolEnabled will show its effect and the send feedback links will disappear. If you do not reboot your computer, the Send Feedback tool will be active till your computer is restarted again. 1) Download the exported registry entry file from here : Windows 7 - Exported Registry Settings for altering FeedbackToolEnabled key value. You can view the contents of the file FeedbackToolEnabled.reg by openning it using the NotePad application. But I do not recommend you to edit it manually. 4) Registry Editor will display a warning message. Click Yes button. 5) After a successfull registry merge, the Registry Editor will display the following information message. 6) Now you should reboot your computer. After restarting your Windows 7 system, the send feedback links will be disabled and will be removed from windows screens.